PPE (Personal Protective Equipment) protects you, your colleague, visitors and your patients from infections. In fact, PPE is a crucial constituent of infection control systems. A CNA use several types of PPE, of which gloves and gowns are the mostly used protective instruments. Gloves are composed of nitrile or vinyl rubber and are proposed to be worn only once. Nurse aides should don them whenever they are likely to come in contact with body fluids of the patient or any infectious material. Gowns are composed of waterproof synthetic fibres, layered with a thick plastic. Gowns are generally donned over uniforms. This personal protective equipment is essential to wear while working with the patients kept in the isolation or when there is a possibility of coming into contact with patient’s body fluids. Infectious agents mostly enter through the nose or mouth. Their entry can be checked by wearing masks. Goggles prevent their entry into the eyes. Many times, you need to protect the entire face from infectious body secretions by wearing a face shield. Hold it in such a manner that its opening comes at your back. Put your arms inside the sleeves of the gown. Tie it at the neck and waist, so that it fits properly. After wearing the gown, put a face mask on your mouth and nose. Cover your eyes with goggles. At last, put the gloves. Grab outer side of the glove at the wrist and remove it by pulling. Utilize the fist of your gloved hand to ball up the glove. Grab the remaining glove from the inner side of the wrist. Remove it by slowly pulling it downwards. Discard the gloves in an appropriate manner. Hold the neckline of the gown and pull it off. This way, the sleeves of the gown will turn inside out. Ball it properly and put in an apt receptacle. Pull out the face mask. Put it in the trash container. Now, take out the goggles. Put it for decontamination. Your gown should be tied properly so that it does not come off while carrying out any procedure on the patient. Make sure that your vision is not interfered by your goggles. Ensure that the gloves are pulled up enough to cover the cuffs of the gown. Dispose all the items properly. Rinse your hands up to the wrist, after removing and disposing all the PPE. What Does an Examiner Observe When You Don and Remove Personal Protective Equipments? Whether you have completed the beginning task or not? Tip- Wash your hands, before commencing the procedure. If you have recognized the type of isolation needed? Tip- Always identify the type of isolation needed. Whether you have put the face mask correctly? Tip- Put mask over mouth and nose. If you have tied the gown at the neck and waist? Tip- Fasten the gown at the neck and waist. If you have applied the gloves in the right manner? Tip- While wearing gloves make sure that they are pulled up enough to cover the cuffs of the gown. Whether you have removed the mask, gloves and gown in a correct way? Tip- First removes the gloves, then gown and at last, takes out the mask. Always follow the steps mentioned above for removing personal protection equipments. Whether you have used the appropriate procedure to dispose personal protective equipments? Tip- Dispose PPE using appropriate procedure. If you have done the completion task? Tip- After finishing the procedure, rinse your hands up to the wrist. Most of the CNAs consider only gloves as PPE. One of the major problems in medical care facilities is that the medical professionals neglect the utilization of PPE and get prone to diseases and infection. When you are a student, it doesn’t matter for you to don PPE, but in the real work settings, PPE acts as a thin line between death and life for your patients and you. You will be compelled to don personal protective equipments, only if, you will assume that each patient is suffering from fatal infection. If you think this way, you will follow precautionary measures to safeguard not only yourself, but also to all others present around you. This is referred as universal precautions. It’s essential to wear PPE, especially at the time of working with a client, who is kept in isolation. As a nurse aide, you would definitely not wish to transfer your germs to your patient, who is already juggling with weak immune system. It’s vital to put on PPE, but it’s not at all wise to go overboard. 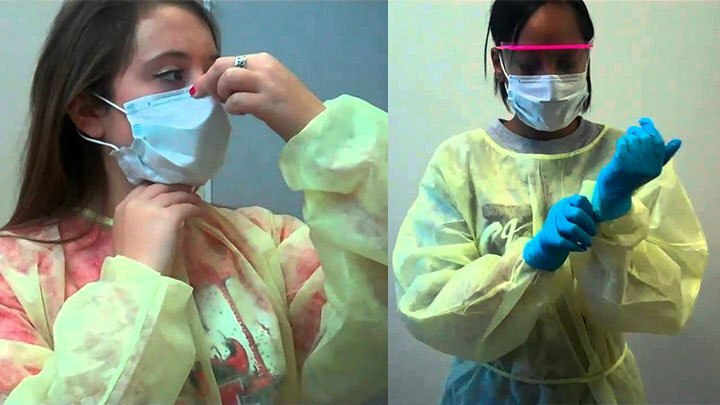 Generally, while dealing with patients suffering from fatal diseases (like AIDS), the certified nursing assistants get so terrified that they begin to wear more than one gloves, gowns and a full face mask. However, the patient will not say anything, but he/she will surely feel offended. Remember that your patients (even those who are suffering from deadly illness) are just like you and they expect you to treat them as humans, not as a ghost. Try to give them happiness in their last days and provide comfort as much as you can.